If you’ve invested in discovering your chamber’s VP (value proposition), and it’s been around for two or more years, you may feel like it’s time to put new life into it – to verify that your message is still relevant and that your organization delivers on the value you promote. that allow chamber pros to do more in less time. During your strategic planning cycle, formally ask board members what they believe members think are the strengths of the chamber. In an unsolicited process, are your strengths among the ones you publish in your value proposition? Have trends shifted? Have your member’s biggest worries or needs changed? How satisfied are members with the services that you say you do well – that your VP is based on? 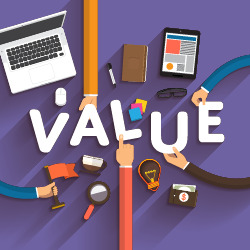 Example 1: Technology was a main value point in a chamber’s value proposition. Their annual member survey uncovered high demand for tech but low usage and members rated the chamber low on how they deliver in that area. Instead of technology as a key value point, the chamber re-crafted their value proposition to focus on a different theme for their message that highlights information and tools that members need, services that are super relevant, and that the chamber does very well. Technology is still an area that the chamber wants to build. But as they grow in proficiency and focus, it’s not a selling point. One state chamber’s value proposition needed to better differentiate what they deliver versus local chambers. The focus shifted from delivering knowledge (common to all chambers) to providing a wider perspective on business and the industry that the member can’t get anywhere else.